LGT Group has become a sponsor for ABT Schaeffler Audi Sport Team for Formula E. Formula E has the unique privilege of being the "world's first fully-electric racing series." The official cooperation between the organizations began on October 24th with Round 1 of the season's events in Beijing. 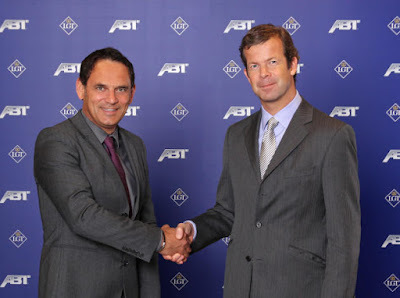 To recognize the new sponsorship, Prince Max met with ABT CEO Hans-Jurgen Abt during which Prince Max praised ABT's commitment to "progressive thinking and innovative technology." This represents the first time LGT Group has sponsored a motorsport organization. 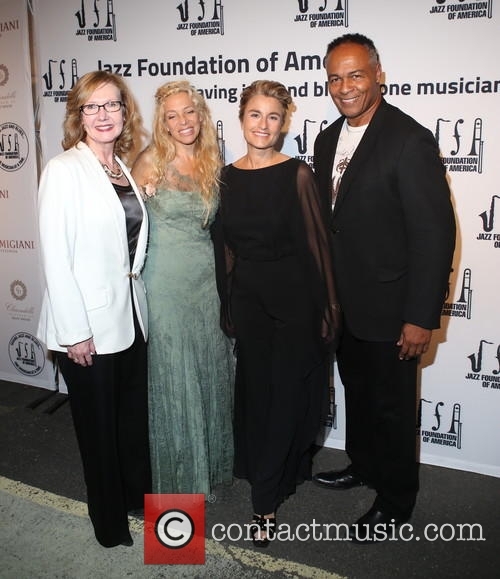 On Thursday last week, October 22 that was, Princess Julie of Nassau, the lovely wife of the Grand Duke's cousin Prince Robert of Luxembourg, was among the guests of the 14th annual "A Great Night In Harlem" gala concert at the Apollo Theatre in New York City. "A Great Night in Harlem" is a benefit concert organised by the Jazz Foundation of America to raise money for the Jazz Foundation's Musician Emergency Fund, which helps elder jazz and blues musicians in crisis across the United States. 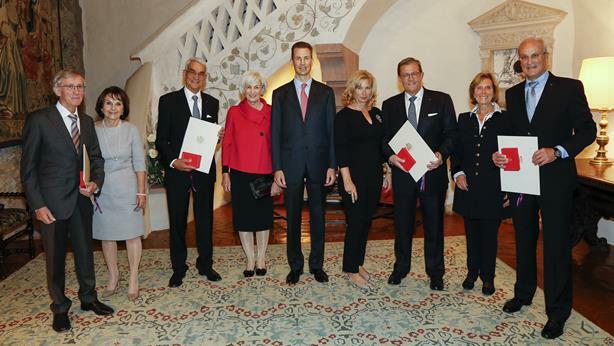 Both Princess Julie and her husband Prince Robert were among the benefit committee co-chairs and also donated Clarendelle wines of one of their wine estates for the occasion. 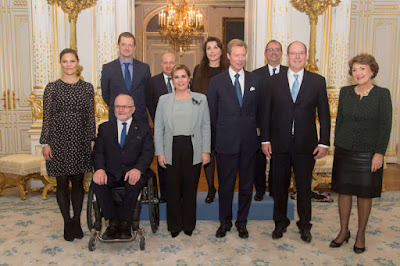 On Tuesday, Grand Duke Henri and Grand Duchess Maria Teresa were in Paris for the 2nd Economic Forum of the Francophonie. This year's event, themed "A Call to Action," aims to put the strategies discussed at last year's Dakar forum into action by uniting the efforts of leaders in both public and private sectors. The forum will see participants from around 80 different countries, with a focus on encouraging ongoing debate and discussion from all attendees. The 2nd Economic Forum of the Francophonie is focused around a number of topics that include, among others, public and private partnerships, being an entrepreneur in an evolving economy, and the role of new technology. Still awaiting photos; they'll be added when they're available. Yesterday, Austria celebrated its national day and Prince Nikolaus was on hand to celebrate with them. 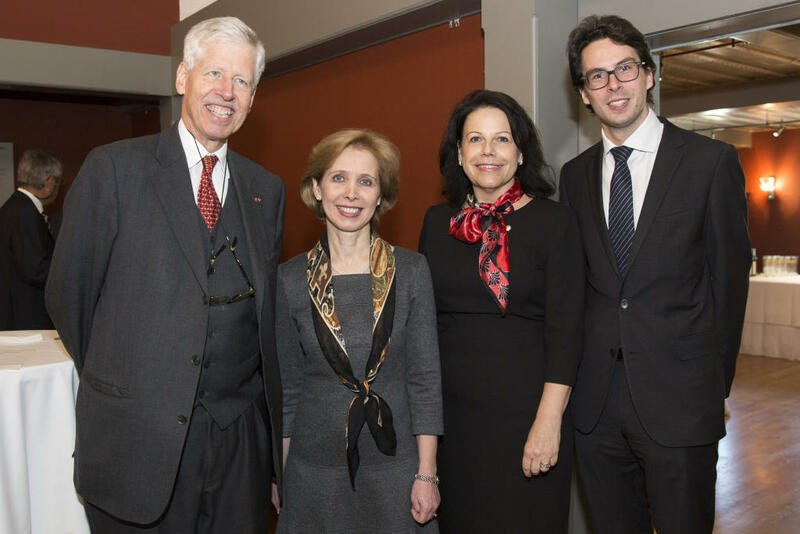 The younger brother of Prince Hans-Adam attended a reception at Vaduz town hall hosted by the Austrian ambassador in Liechtenstein and the Austrian honorary in the Principality. On October 26 each year, Austrians celebrate their country's declaration of permanent neutrality after World War II and its regained status as an independent and sovereign nation, which took place on October 26, 1955. Today, Hereditary Prince Alois awarded the Order of Merit of the Principality of Liechtenstein to not one but four deserving citizens of the Ländle. The Commander's Cross of thr Order was given to Ekkehard and Jürgen Hilti of the convenience food producer Hilcona; Eugen Längle, who used to own Mixpac, Werfo and Mold, a developer and producer of two-component mixers and systems primarily for the dental and industrial markets; as well as Fritz Kaiser, co-founder and executive chairman of Kaiser Partner, a wealth management firm that provides family office and wealth management services to private wealth owners and their advisors. And while the last one was the longest explanation, it's worth noting that Liechtensteiners don't only make their money in the financial sector. Shocking, I know. Fun fact: Did you know that Liechtenstein is the largest producer of false teeth in the world? Yesterday, Hereditary Prince Alois received five new ambassadors to the Principality at Schloss Vaduz for short audiences. The five new mostly non-resident ambassadors who presented their letters of credence to Liechtenstein's regent were: Friis Arne Petersen of Denmark, Gonzalo Ricardo Salvador Holguin of Ecuador, Anne Elisabeth Luwema of the Netherlands, Jaromir Sokolowski of Poland as well as Thomas E. Gullickson of the Holy See and quite obviously pictured above. Each year in August and September, the Schueberfouer is held on the Glacis Square in the Limpertsberg quarter of the city of Luxembourg. 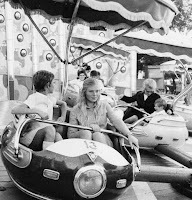 Today a funfair, its history goes way, waaay back. The year is 1298 and Heinrich VII rules as count of Luxembourg when the future King of Germany (since 1308) and Holy Roman Emperor (since 1312) takes the initiative of establishing a fourty-day long summer market in Luxembourg. However, the market soon falls apart. So, let's fast forward to 1340: Heinrich VII’s son, Jean (known as John the Blind, Jean l’Aveugle or Jang de Blannen in different languages), is ruling as count of Luxembourg and king of Bohemia. 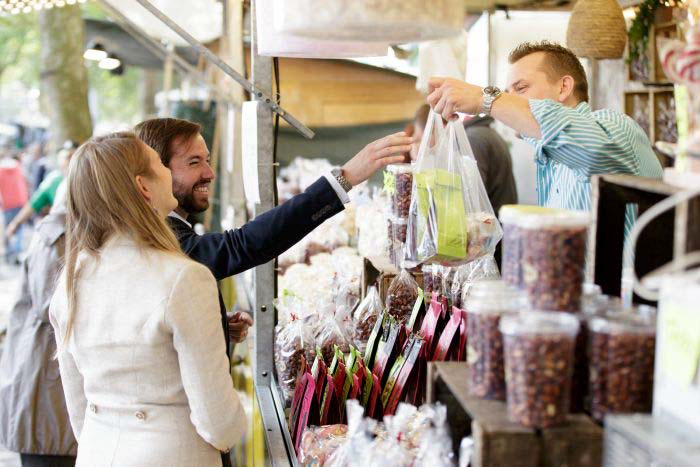 Following his father’s example, he decides to create a grand market in Luxembourg that will draw merchants of all kinds from surrounding areas to sell their products. And so on October 20, he decreed that a market lasting eight days should be held. Jean decided that the market should coincide with the eve of Saint Bartholomew’s feast day, opening the 23 of August and closing on the 31st at noon. The market established by the ruler of the House of Luxembourg soon became a huge hit both with the merchants and the population. Merchants from abroad paid a fixed fee to participate with no additional customs duties and no taxes on sales. In addition, Jean guaranteed their protection - and the protection of their goods - while they participated in the market plus a seven days before and after. Already since its beginning, the market was known as Schueberfouer. The name is believed to be derived from the name of the market place where it was first held: the Schuedbuerg, today's Plateau du St Esprit. Another theory links it to the German word Schober, or barn in English, in turn linking it to its original purpose. For hundreds of years, everything from agricultural products and livestock to cloth, pottery and other household items was sold at the Schueberfouer. The fair was moved in 1610 to the Glacis, a huge open space beyond the westward fortifications of Luxembourg City, after the Limpertsberg wood had been removed to improve the defensive capabilities of the city. Already during the 18th century, shows and games became part of the fair but it was not until the early 20th century that it became the funfair the Schoeberfouer is known as today. With the year 2015 marking the 675th edition of the fair, it is not only one of the oldest but also one of the biggest of its kind. The Schueberfouer is visited by about two million visitors, four times the number of inhabitants the Grand Duchy has, each year. Fun(ny) fact: A herd of sheep are the first to officially enter the Schueberfouer on its first day after the opening ceremony ribbon has been cut. They are accompanied by a band, dressed in the traditional blue coat and red scarf of shepherds, playing a tune called Hämmelsmarsch inviting the people to come out an joing the fair. While the origin of the tradition is somewhat of a mystery, historians believe it goes all the way back to the 14th century. The Hämmelsmarsch isn't only played for the Schueberfouer but all throughout Luxembourgish villages and towns whenever a funfair is held. Wedding news: Back on September 6, Prince Georg von der Leyen und zu Hohengeroldseck and Countess Nathalie von Königsegg-Aulendorf religiously married in the Austrian town of Frauenkirchen after already civilly saying 'I do' on August 1 in Germany. This week's edition of Bunte* has a report about the wedding that counted Hereditary Prince Alois and Hereditary Sophie as well as Princess Tatjana and husband Philipp von Lattorff among its guests. Other royal and noble attendants included Sophie's sister Duchess Marie and husband Duke Philipp of Württemberg as well as Princess Irina of Hesse, her husband Count Alexander of Schönburg-Glauchau and their daughter Maria-Letitia. It feels a bit like we are having a bit of an Anunciata week here at Luxarazzi (see why here and here) and today we even have an Anunciata and Astrid day - and you know what, there's even another princess in the mix! On October 13, Princess Maria-Anunciata and Princess Marie-Astrid, were among the guests for the pre-opening of Frieze London. 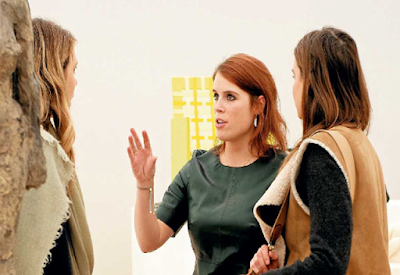 At the contemporary art fair the daughters of Prince Nikolaus and Princess Margaretha were seen talking to Princess Eugenie of York, granddaughter of the British Queen. Prince Jean of Luxembourg and Guest attend the 'FIAC 2015 - International Contemporary Art Fair', Getty Images tells us. And as any Luxarazzi regular will have noticed by now, that 'guest' is of course his niece, the lovely Princess Maria-Anunciata of Liechtenstein, daughter of Prince Jean's twin sister Princess Margaretha. The uncle-niece duo was out and about at Le Grand Palais in Paris yesterday. More pictures of the event at Getty Images. 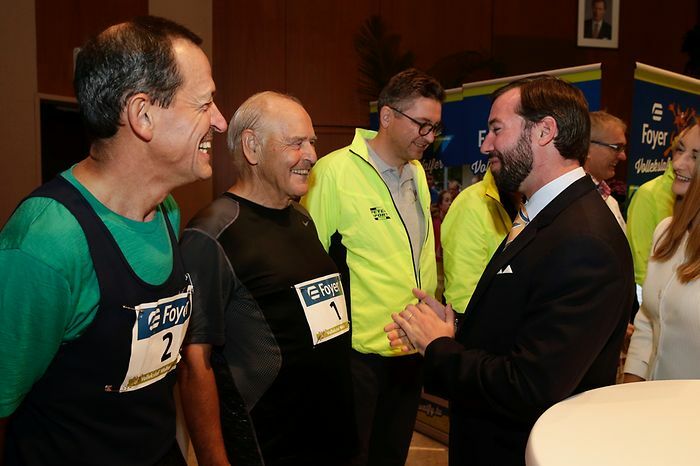 The Grand Ducal tennis fan numero uno, Grand Duke Henri, was on hand once again to cheer on the tennis players at the BGL BNP Paribas Luxembourg Open. Today, he watched the first round match between Mandy Minella of Luxembourg and former world number one Serbian Jelena Jankovic. Unfortunately for the Grand Duke and the whole Grand Duchy, Minella lost 1:6 and 4:6. Nevertheless the Luxembourgish player said after the match, "It was a great honour for me that the Grand Duke was present today." A big gallery of visuals with very few of the Grand Duke inbetween at Tageblatt. More pictures at RTL, who also have a video. 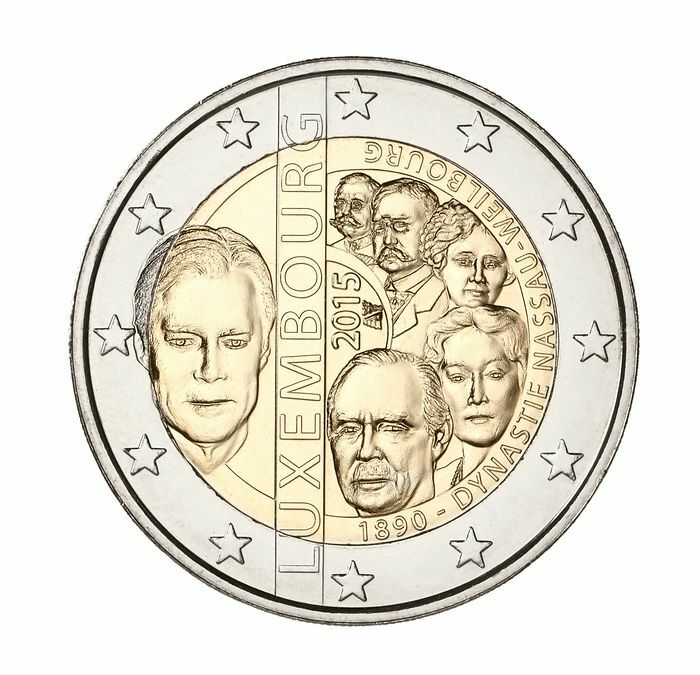 At least six: A new coin issued by Luxembourg's Central Bank features all Luxembourgish heads of state of the Nassau-Weilburg dynasty starting with Grand Duke Adolph via Grand Duke Wilhelm IV, Grand Duchess Marie-Adélaïde and Grand Duchess Charlotte all the way to Grand Duke Jean and Grand Duke Henri. 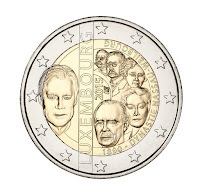 Purchasing the special edition commemorative coin would cost you 10 euros. You can also spring for the "Belle épreuve" box set containing special editions of five 2015 coins produced with the image of Grand Duke Henri, for a cost of 95 euros. More info about these and all other coins newly minted this year at Wort in English. Grand Duke Henri was in Peppange today where he paid visits to not one but two museums. First on his agenda was the carriage museum featuring six carriages formerly used by the Grand Ducal Family and all made between 1890 and 1905. While one of them, the Grand Coupé de Gala, is actually still owned by the family, the other five belong to a private collector. All in all, there are more than 20 carriages exhibited at the museum. 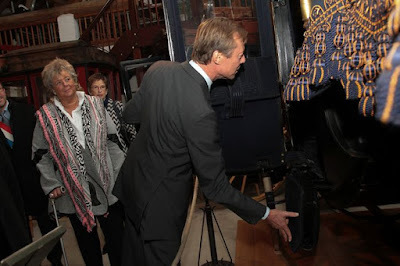 The Grand Duke's visit to Peppange, during which he was accompanied by local dignitaries, was concluded by a short visit to the nearby farming and craft museum and a tour of the museum's farmhouse. Galleries of visuals at Wort and Tageblatt. After some (sparkling) wines for his three year civil wedding anniversary yesterday, Hereditary Grand Duke Guillaume went solo for the religious wedding anniversary. 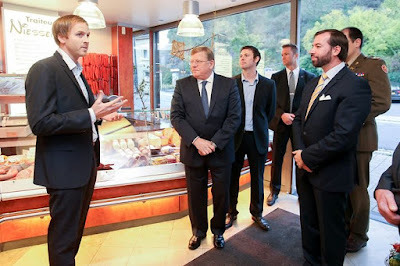 And let's just say, it was meaty as he visited the Niessen butchery in Ulflingen this morning. The Herereditary Grand Duke was given a tour of the production sites of the organic butcher by its owners, Jean-Marie and Patrick Niessen. His visit is part of a series of visits organised by FEDIL, which aims to allow Guillaume to see the activities of member companies. 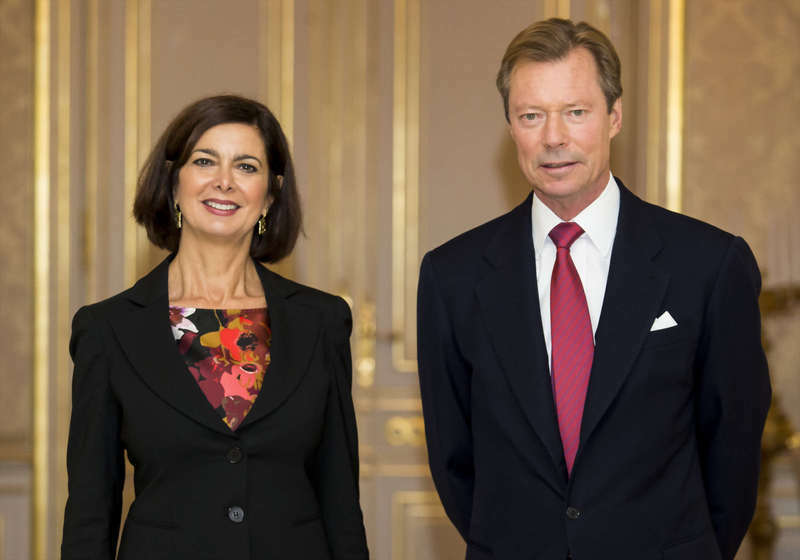 Yesterday, Grand Duke Henri received Laura Boldrini, President of the Chamber of Deputies of the Republic of Italy, for an audience at the palais grand-ducal. Mrs Boldrini, a former spokesperson for the United Nations High Commissioner for Refugees (UNHCR), is currently on a working visit to the Grand Duchy. 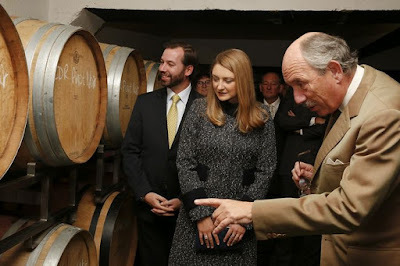 Hereditary Grand Duke Guillaume and Hereditary Grand Duchess Stéphanie celebrated their third civil wedding anniversary with some sparkling wine, or at least with a visit to a sparkling wine producer, Caves Bernard Massard, today. The family managed company is the main producer of traditional method sparkling wines in Luxembourg. The Grevenmacher winery, that also produces still wine, was established in 1921 by Jean Bernard-Massard, a Luxembourgish winemaker who learnt his skills in the Champagne. It has been run by the Clasen family for almost 80 years. The Hereditary Grand Duke and the Hereditary Grand Duchess were given a tour of the winery and cellars, and also tasted some of the wines. Before the royal visit, the owners Hubert Clasen and his son Antoine hosted a presentation introducing their 2014 vintage. First pictures of the visit to the Grevenmacher winery at Wort and Tageblatt. On Sunday, Prince Félix was in Limpertsberg, at the Centre Cultural Tramschapp, to attend a gala in support of the BGL BNP Paribas Luxembourg Open as this year marks the 25th anniversary of the WTA tennis tournament that takes place each year in the Grand Duchy. Last year we saw both the Grand Duke and Prince Félix at the tournament, and the year before it was the head of state and the Hereditary Grand Ducal Couple who enjoyed themselves some tennis. Grand Duke Henri and Grand Duchess Maria Teresa are both patrons of the event. Some photos available on Facebook and at Tageblatt. 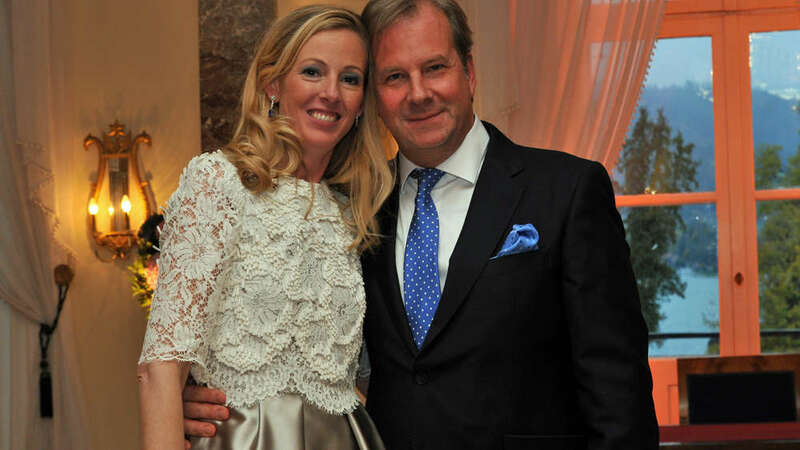 On Friday, Duchess Anna in Bavaria, younger sister of Hereditary Princess Sophie, civilly married Baron Andreas of Maltzan at Schloss Tegernsee. The couple was married by local mayor Johannes Hagn with a party for immediate family and close friends - there were 170 people after all - taking place afterwards. Duchess Anna split from her husband of seven years and father of her two sons, Klaus Runow, last year. 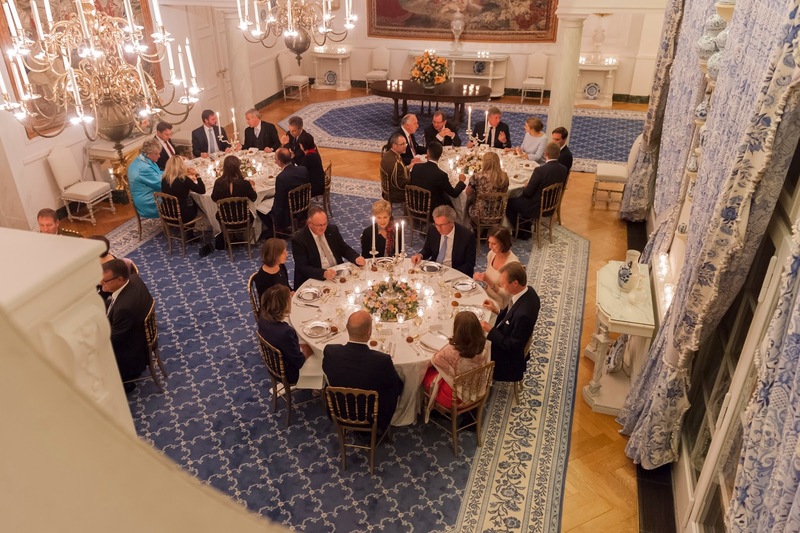 Thus far only three pictures of Duchess Anna and her new husband have been released (and non of the guests) but I guess that Hereditary Princess Sophie and her family were present for the wedding. More information at Merkur. 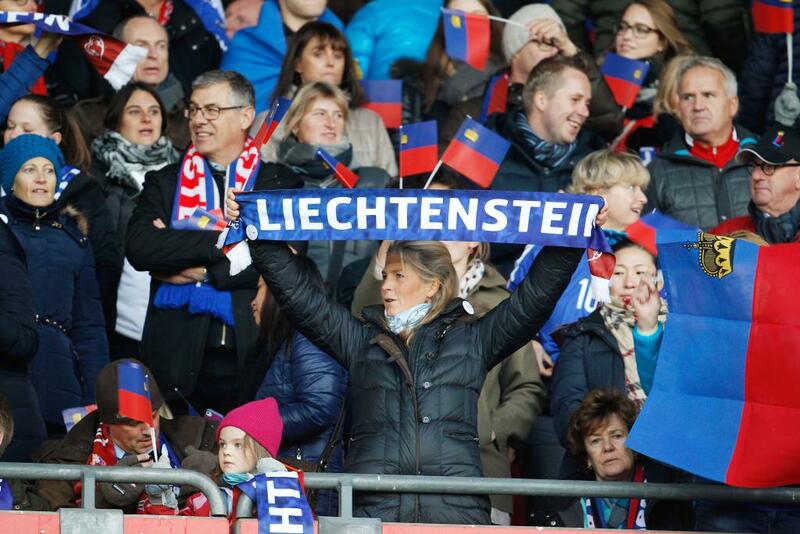 Earlier this week, on Monday to be precise, Liechtenstein had its last qualifying match for the Euro 2016 finals (which they rather unsurprisingly didn't make). Gathering five points during the whole qualifying round, they also lost their last match to Austria, who finished with 28 points, at the Ernst Happel Stadion (0-3). In Vienna to cheer on the Liechtenstein team was Princess Tatjana, only daughter of the Prince Hans-Adam II, a Liechtenstein scarf as well as her husband Philipp von Lattorff (half hidden behind the small Liechtenstein flag on the left) and possibly their daughter Sophie, the young girl between them. 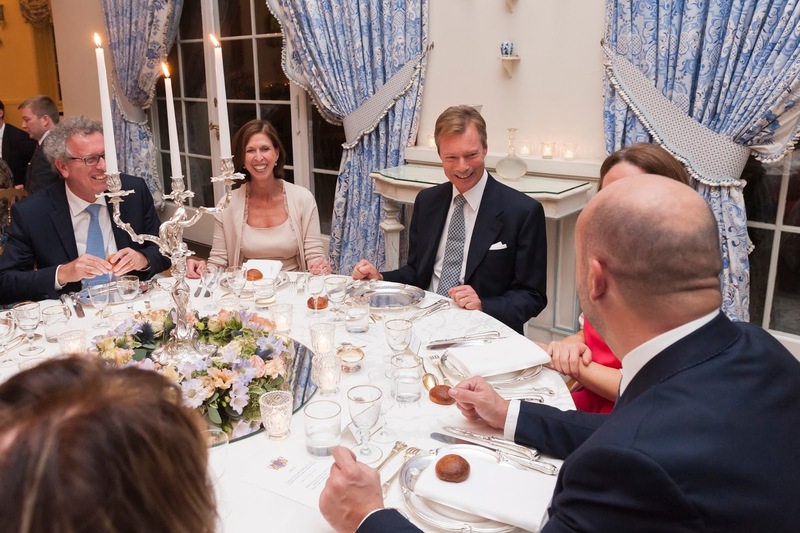 Princess Maria-Anunciata, oldest daughter of Prince Nikolaus and Princess Margaretha, was among the guests for the PAD London launch at Berkeley Square on Monday this last week. PAD is a fair for 20th century art, design and decorative arts taking place for the 9th year in the heart of Mayfair. At the event, the Liechtenstein princess was pictured together with Lybian Princess Alia Al-Senussi. 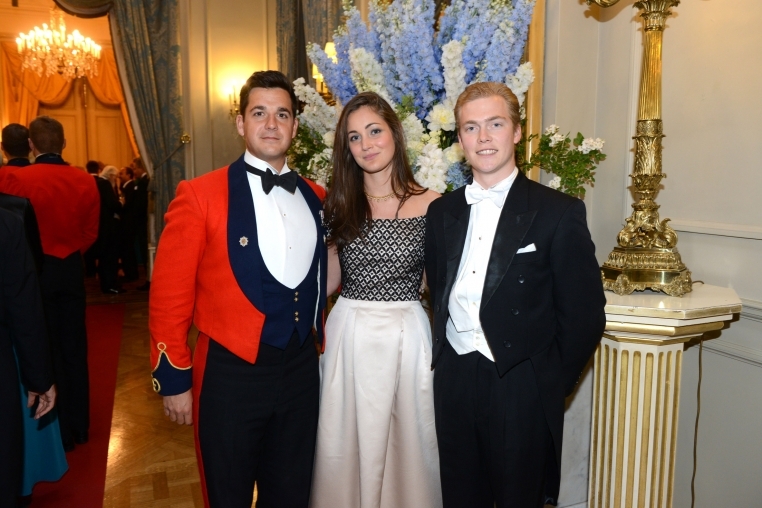 Other (royal and royal-related) guests at the art event included Crown Prince Pavlos of Greece as well as Tatiana Santo Domingo. For more pictures, have a look at Rex. Yesterday afternoon, Grand Duchess Maria Teresa was in Mondorf-les-Bains where she attended a conference on equality between women and men in political and economic decision making. The conference was co-organised by the Ministry of Equal Opportunities, which is headed by Lydia Mutsch, and the Conseil National des Femmes du Luxembourg (CNFL). Yesterday, Hereditary Grand Duke Guillaume was in Kirchberg to attend the EUROCHAMBRES Economic Forum with Minister of Finance Pierre Gramegna, who was also a speaker at the event. The forum focuses on various socio-economic issues that face Chambers across Europe. Topics at this year's forum included discussions about social change, an increasingly virtual world, border challenges, and economic decentralization, among others. Still awaiting photos, but fingers crossed there will be some to add soon! 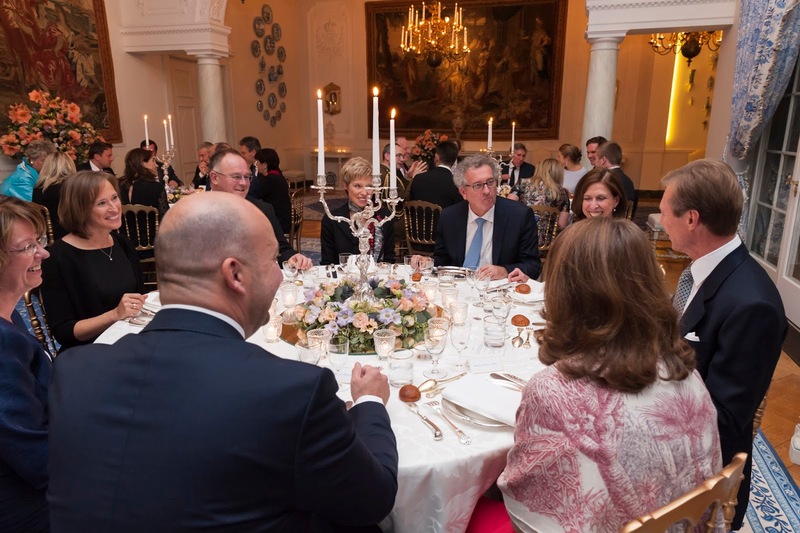 Grand Duchess Maria Teresa hosted International Paralympic Committee’s (IPC) Biennial Honorary Board meeting at the palais grand-ducal. The 5th meeting of this kinds was attended by Prince Albert II of Monaco, Crown Princess Victoria of Sweden and Princess Margriet of the Netherlands, among others. 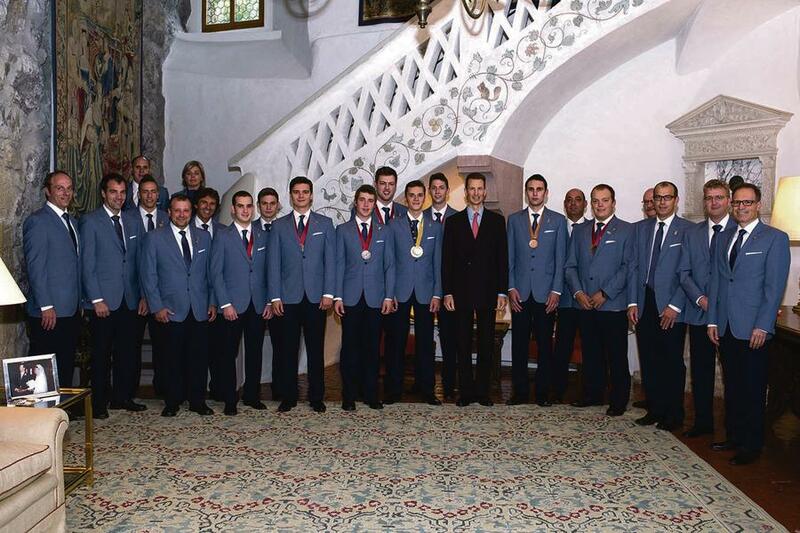 The royal group was also joined by Grand Duke Henri for a photograph. 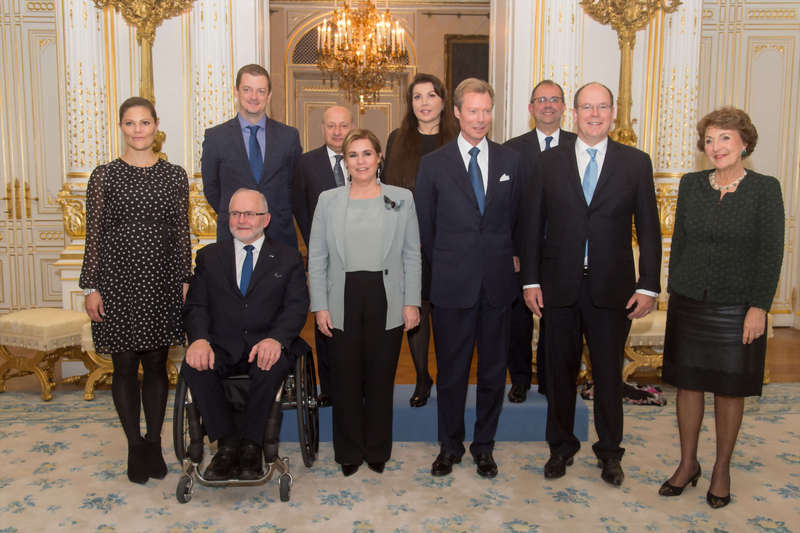 The Grand Duke also used the opportunity to award Sir Philip Craven, President of the International Paralympics Committee, with the Civil and Military Order of Merit of Adolph of Nassau. Pictures of the meeting at the cour, Wort, RTL, and Tageblatt. 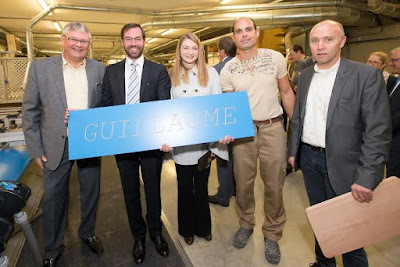 Today, Hereditary Grand Duke Guillaume and Hereditary Grand Duchess Stéphanie were in Schifflange to visit Menuiserie Chimello (a carpentry/joinery business). They heard a presentation by company director Robert Jelsma, followed by a guided tour of the workshops. Francine Closener, the Secretary of State of the Economy, was also in attendance for the visit. This event is in conjunction with the series of visits organized by the Chambre des Métiers, for the Hereditary Grand Ducal couple to learn more about companies that specialize in certain trades. A few more photos at Wort. Yesterday, Hereditary Grand Duke Guillaume and Hereditary Grand Duchess Stéphanie were in Hupperdange to visit the organic farm Schanck-Haff, which is run by Jos and Marlene Schanck and their son Alexander. 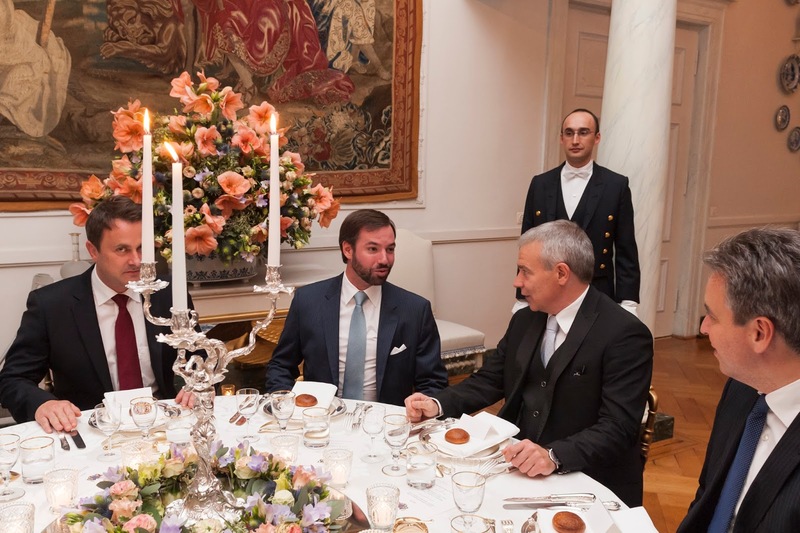 The Hereditary Grand Ducal couple attended at the invitation of Bio-Lëtzebuerg and were accompanied by Fernand Etgen, the Minister of Agriculture, Viticulture and Consumer Protection. Jos Schanck is the president of Bio-Lëtzebuerg, and he and his family have been active in supported organic farming activities in Luxembourg since 1980. The farm Schanck-Haff is a member of APFAPL (Association pour la promotion des fermes d’accueil et pédagogiques au Grand-Duché de Luxembourg) or the Association for the Promotion of Host Farms Teaching in the Grand Duchy of Luxembourg, which aims to educate people in Luxembourg, including school groups, about local agriculture. Pictures of the visit over at Tageblatt. Today is the European Day for Organ Donation and Transplantation. As the need for organ transplants is increasing worldwide, the on-going lack of available organs has resulted in an increase in the number of patients on the waiting list. In the European Union alone, 70,000 people are waiting for organ donations. Each day, on average, 14 people die while waiting for a transplant. To raise awareness on the importance of being an organ donor, a Charity-Indoor Spinning-Marathon was held at the LuxExpo today. Among those cheering on the athletes was Princess Claire (wearing a Bless the Mess Blazer). You might recall that the wife of Prince Félix is preparing her doctoral thesis on the bioethical evaluation of consent for organ donation with particular reference to Germany, Austria and the United States. A gallery of visuals of the event at Tageblatt and RTL. After three and a half months, 30 matches and a third place race off, we are finally here: The Grand Final of the Luxarazzi Tiara Race or the one that will decide which one is your favourite tiara of the Grand Ducal Collection. First of all a big thank you to everyone who has voted in the last 31 polls and to those who commented and shared their views - this was a lot of fun! Also, congratulations to the Empire Tiara which is leaving the Race on a high note winning the small final by almost two thirds of votes against Queen Victoria Eugenia's Aquamarine Tiara. This time around, you will have eight days to vote (until Sunday, October 18), so enough time for careful consideration. 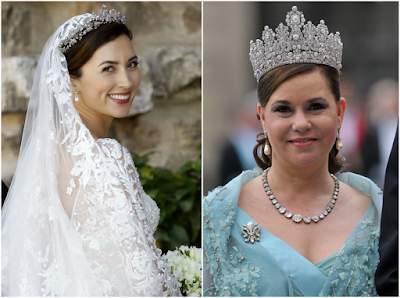 Have fun and don't forget to tell us below which tiara got your vote! 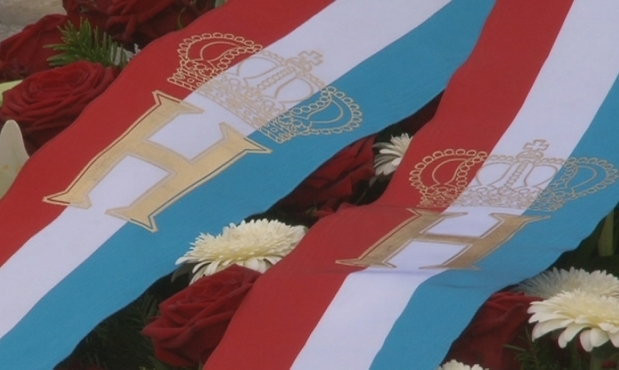 Today is Luxembourg's national day of commemoration which takes place each year on October 10, if the day falls on a weekend like this year, or the Sunday closest to it. On that day in 1941, the German occupiers organised a survey of Luxembourgish civilians who were asked about their nationality, mother tongue and racial group to find out who was Jewish or Italian, for example, and to pave the way to integrate the Grand Duchy into the Third Reich. The Nazis considered the people of Luxembourg to be German as well and expected them to answer the questions accordingly. Resistance fighters within the Grand Duchy realised what the true aim of the census was and thus started a massive awareness raising campaign so that Luxembourgers would write into the forms just what they were - Luxembourgers. Some 97 percent of the inhabitants of the Grand Duchy declared in the census their Luxembourgish identity and expressed that mir wëlle bleiwen wat mir sin (we wish to remain what we are) - the Grand Duchy's national motto. The refusal to declare themselves as German citizens led to mass arrests among the population. 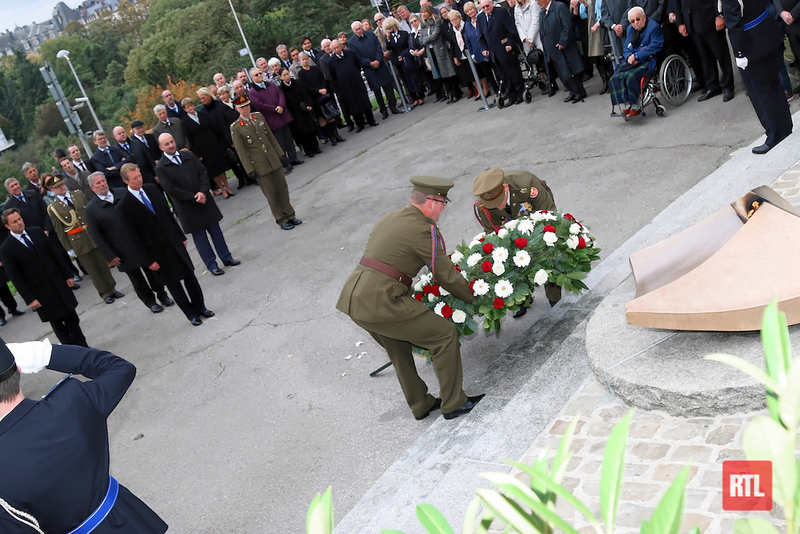 To mark the day, masses and wreath laying ceremonies take place all over the country. 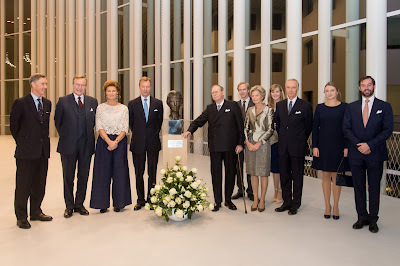 Grand Duke Henri particpated in a religious service held the at the Cathédrale Notre-Dame and afterwards laid a wreath at the Monument vun der nationaler Solidaritéit on the Kanounenhiwwel where he also relit the eternal flame before visiting the interior of the memorial commemorating the fallen of the Second World War as well as Luxembourgish resistance and solidarity. 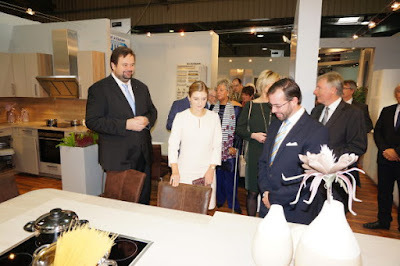 The Hereditary Grand Duke and the Hereditary Grand Duchess paid a visit to the new autumn fair, the "Home and Living Expo", at Luxexpo earlier today. The fair focuses on decorating, design as well as architecture, and features some 300 designers from the Greater Region, meaning Luxembourg plus the surrounding parts of Germany, France and Belgium. Hereditary Grand Duke Guillaume and Hereditary Grand Duchess Stéphanie were given an inaugural tour and also attended the official opening ceremony featuring a number of speeches (and I can't help thinking that the picture above looks a bit as if they are considering to buy the chairs). For more pictures, have a look at L'essentiel, Wort and Tageblatt. A video can be found at RTL (starting at 9:35). 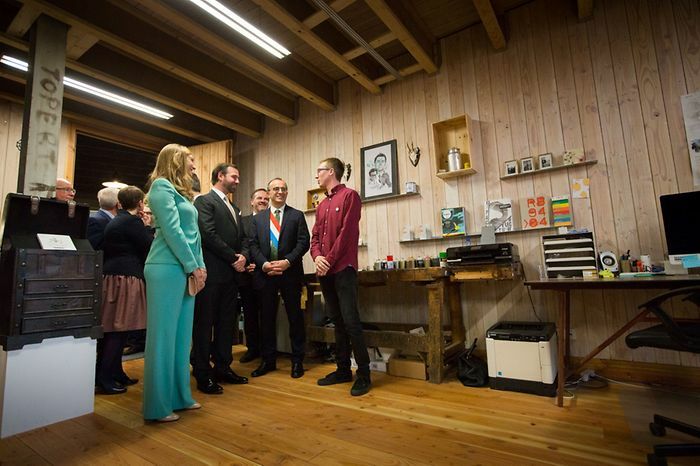 Earlier this (Friday) evening, Hereditary Grand Duke Guillaume and Hereditary Grand Duchess Stéphanie were among the guests for the official opening of the 1535° creative hub in Differdange. The former factory building by steel producer ArcelorMittal has been turned into workspace for some 200 young creatives from the fields of art, technology and more. The Hereditary Grand Ducal Couple was welcomed at the site by local mayor Roberto Traversini, which you can easily recognise by the fancy sash in the picture above. For the inauguration, they were accompanied by the Minister for Economy, Internal Security and Defense, Etienne Schneider, and Claude Meisch, Minister for Children and Youth, Higher Education and Research, and National Education. Galleries of visuals at Wort and RTL. 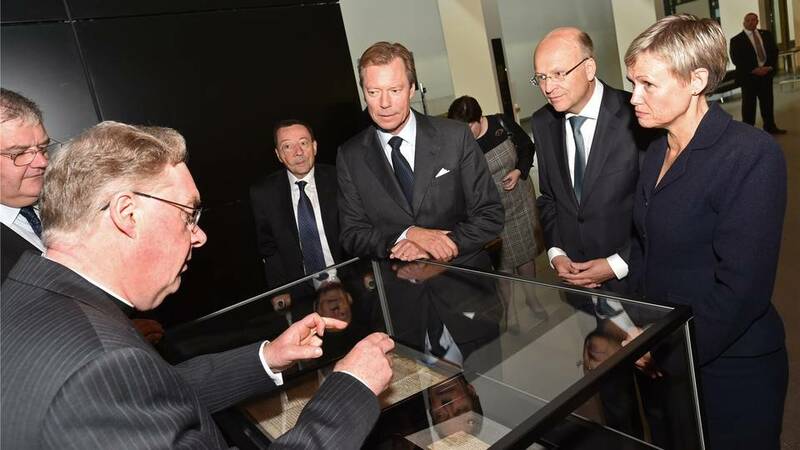 The Magna Carta is currently on exhibit at the European Court of Justice in Luxembourg as part of worldwide festivities to celebrate its 800th anniversary. This morning, Grand Duke Henri went to see the charter drawn up in 1215 to protect the rights of free English subjects from the King John of England and thus essentially laying the foundations for the rule of common law. The Grand Duke was accompanied by the new President of the European Court of Justice, Koen Lenaerts, European Court judge François Biltgen and Marc Jaeger, judge at the General Court of the European Union. No pictures as of yet, but we will add them as soon as any pop up. Two pictures at Lëtzebuerger Journal. To celebrate their 25th anniversary, Grand Duke Henri received a delegation of members of the Georges Kayser Altertumsfuerscher at the palais today. The Georges Kayser Altertumsfuerscher are a group of archaeologists who have their main excavation sites at a Gallo-Roman farming complex near the village of Goeblange in southern Luxembourg as well as through the entire Grand Duchy whenever archaeological remains are found. At the Paschtoueschhaus in Nospelt, the association also runs a museum. As every so often during the last few weeks, no pictures as of yet but will be added if any become available. 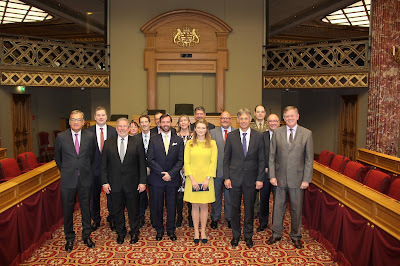 Yesterday morning, Hereditary Grand Duke Guillaume and Hereditary Grand Duchess Stéphanie visited the Grand Duchy's Chambre des Députés. At the parliament, the couple was received by its president, Mars di Bartolomeo, the members of the bureau of the chamber as well as its secretary general, Claude Frieseisen. During the meeting, Guillaume, Stéphanie and their hosts focused on the legislative process, current parliamentary issues as well as current challenges ahead of the beginning of a new parliamentary session next week. 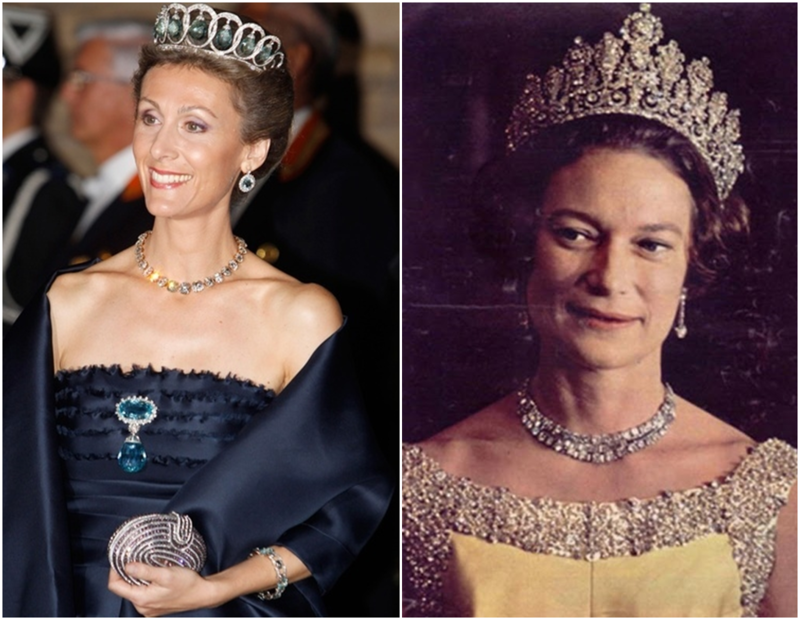 It's time for the final, the small final that is - the match of those two tiaras who did put up a good fight but lost their semifinals in the end, Queen Victoria Eugenia's Aquamarine Tiara and the Empire Tiara. Because, you know, it never hurts to have an additional tiara poll. Plus, it gives one of the following sparklers the chance to end the Luxarazzi Tiara Race on a high note! We will see both our grand finalists, the Belgian Scroll Tiara and the Diamond Vine Leaves Tiara (which reached about 55 percent of votes in our second semifinal), again on Saturday. In a way, it seems that the small as well as the grand final have quite equal tiara matches, at least size-wise. Heading off against each other in the third place race off are Queen Victoria Eugenia's Aquamarine Tiara, worn by her great-granddaughter Princess Sibilla above, and the Empire Tiara, the one which would have apparently won if we had asked for your favourite tiara that most looks like a crown or is in a league of its own. Hurry up, voting already closes on Saturday night (Lux time) this time around. At noon today, Grand Duke Henri received Vassilios Skouris, outgoing President of the Court of Justice of the European Union, for a last audience on the occasion of the end of his presidency. Mr Skouris served as the President of the highest court of justice for European Union laws, which has its seat in Luxembourg, since 2003 after having been a member of the court since 1999. No pictures yet but they will be added if any become available. The cour grand-ducale announced today that there will be a major reorganisation of communication and administrative roles. You might recall that there have been quite a number of people who have quit their jobs as of late and now the reorganisation shall bring the solution. 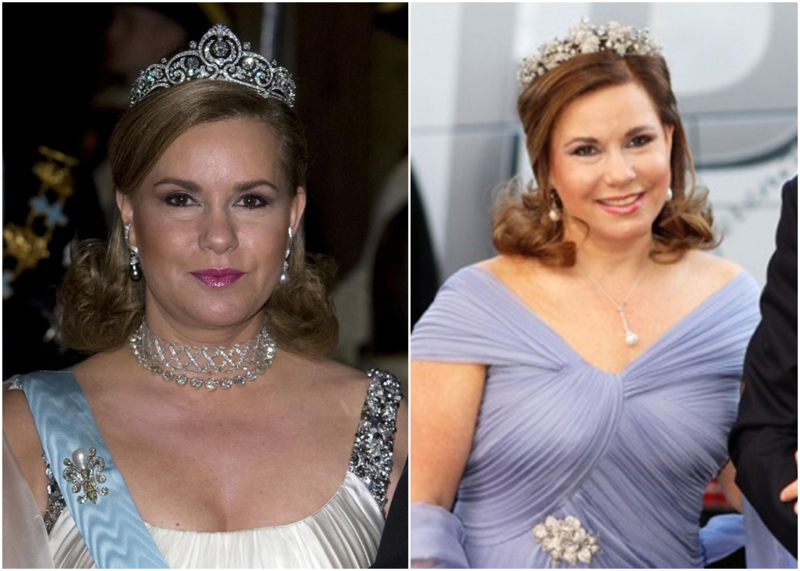 Plus, the cour also stated that Grand Duchess Maria Teresa suffers from the same symptoms as Crown Princess Mette-Marit when it comes to flying. During a press conference today, it was announced that during the past few months there have been internal audits at the cour led by psycho sociologist Chantal Selva to find a way to reorganise its dealings. 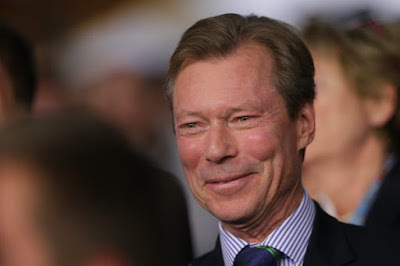 In the future, there will be a a new private cabinet for the Grand Duke, which is to be headed by Michel Heintz. Together with his team, he will keep the Grand Duke updated about current political events, prepare audiences, write speeches and act as a court spokesman. The Grand Duchess will have her own staff, led by Guy Schmit. 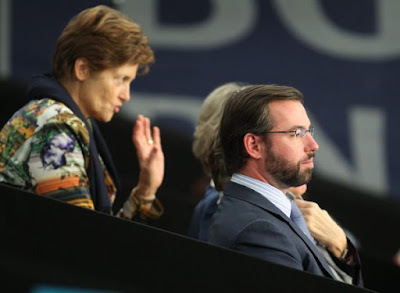 Hereditary Grand Duke Guillaume and Hereditary Grand Duchess Stéphanie have their own secretary. Henri Chrisnach, head of protocoll and aide de camp of the Grand Duke, will head the cour's organisation. 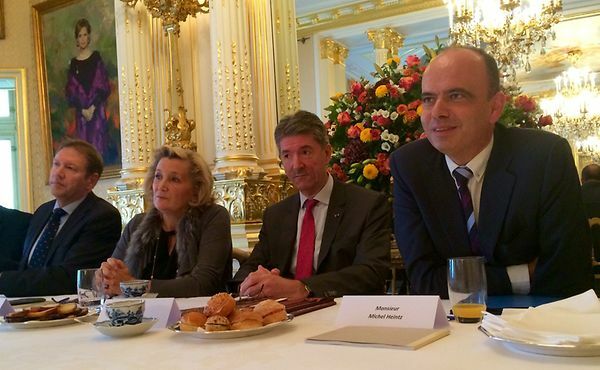 Jean-David van Maele will become general secretary of finances. A new pilot communications committee will be responsible for press relations and headed by Nadège Lartigue. (Here's hoping they'll get better at updating their official website...) There is not yet a successor for Pierre Bley, who will remain court marshall until the end of the year. During the press conference it was also mentioned that the Grand Duchess had not accompanied the Grand Duke on a number of trips abroad as she is suffering from an acute fear of flying, which she has not been able to overcome. More info is available at Wort in German. Ladies and gentlemen, we have our first finalist - and the Belgian Scroll Tiara it is! The all-diamond sparkler beat Queen Victoria Eugenia's Aquamarine Tiara by almost two thirds of votes in the first one of our semifinals. Was it a choice you expected? And which tiara will it face in the grand final?! The Vollekslaf Walfer is celebrating its 40th anniversary this year and Hereditary Grand Duke Guillaume and Hereditary Grand Duchess Stéphanie were in Walferdange to celebrate with the particpants of the fun run and spectators and hand out the prizes.. Won by Yonas Kinde, the the 12 kilometre race counted no less than 1,392 participants, or even 3,109 when you count all the children and teenagers taking part in shorter distances. Prior to the race, the Hereditary Grand Ducal Couple also met with Hubert Fuhrmann and Serge Wantz, the gentlemen with the bib numbers 1 and 2 respectively, who both took part in the race for the 40th time. Pictures at Wort and on Facebook. Frankly, I have no idea why we missed so many Liechtenstein news! There was Alois at the technology plant and Alois and the WorldSkills Team; then there was Sophie at the season opening and Sophie becoming the patron of a new(-ish) organisation; as well as Philipp and the jubilarians. 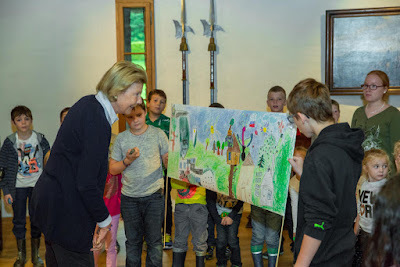 And now this, the missed cherry on top: Princess Marie celebrated her name day on September 14 together with 40 children from the municipality of Planken. 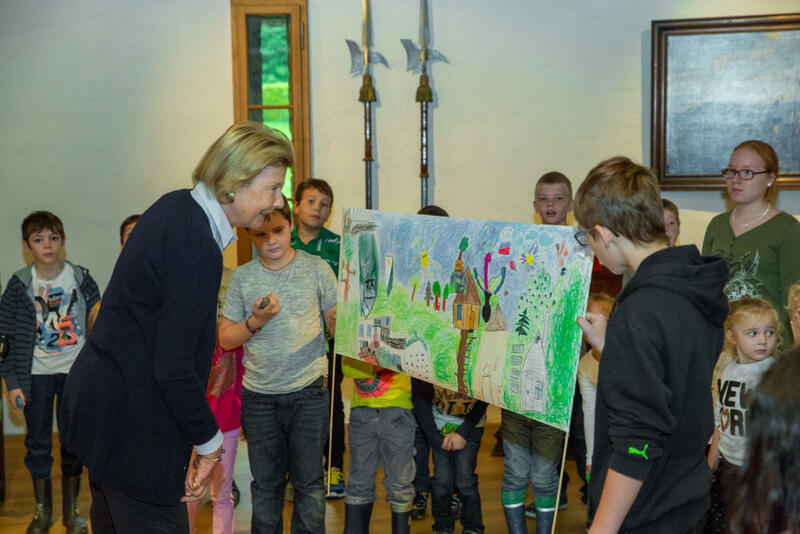 Each year, the Princess invites kindergarten and primary school children from some part of Liechtenstein to Schloss Vaduz to celebrate her name day as her actual birthday usually falls into the school holidays. A gallery of visuals of the celebrations at Vaterland. Yes, it's that time of the year again: Like he does every once in a while, Prince Philipp took the LGT's jubilarians of the second half of 2015 to visit another company in the Principality on Wednesday, this time around it was the ceramic workshop Schädler. Together the 92 jubilarians have worked for the LGT Group for more than 1400 years. To round off the day, they also had dinner with the Chairman of the Board of Trustees. Catching up with the Liechensteins, part four: Hereditary Princess Sophie was among the guests for the season opening of the TAK theatre in Schaan back on September 12 on was pictured at the event with artistic director Thomas Spieckermann (left) and chairman of the board Werner Bachmann. After a panel discussion, the The Epic of Gilgamesh was shown. Somehow we missed quite a bit of Liechtenstein news during the past week or two... High time to catch up: Hereditary Prince Alois visited the ThyssenKrupp Presta TecCenter in the Principality's municipality of Eschen about two weeks ago on September 19. Liechtenstein's regent toured the facilities, which produces camshafts and camshaft modules, valve train systems and bearing blocks. For more photos and information have a look at either Volksblatt or Vaterland, or both. 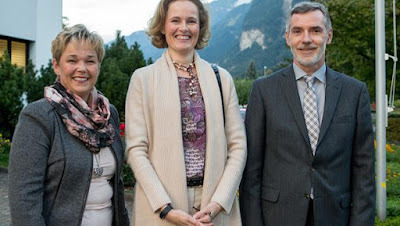 Hereditary Princess Sophie took part in the general assembly of the Familienhilfe Balzers family aid organisation. During the assembly it was announced that the organisation, the oldest one of the its kind in Liechtenstein, will merge with the Schlossgarten retirement home on January 1, 2016. 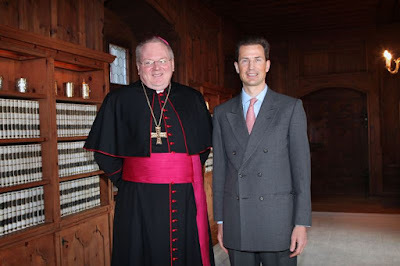 Hereditary Prince Sophie will become the patron of the new organisation to be called Lebenshilfe Balzers (life aid). More information about the general assembly at Volksblatt. Grand Duke Henri and Grand Duchess Maria Teresa visited the Foyer Marienthal refugee home today. Accompanied by the Minister for Family and Integration Corinne Cahen, they toured the facility and met about 120 refugees from Syria and Balkan countries such as Kosovo, Bosnia-Herzegovina, Albania, Serbia and Montenegro. More pictures of the day at Wort and Tageblatt. 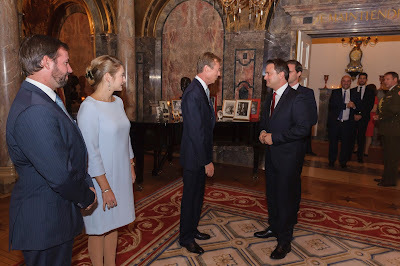 Grand Duke Henri presumably received a few new ambassadors to the Grand Duchy in audiences today. 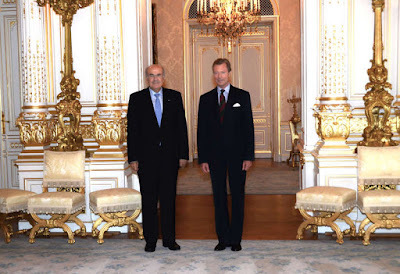 At least he did so with Austria's new ambassador to Luxembourg Gregor Schusterschitz, who presented his letter of credence to the Grand Duke today at the palais grand-ducal. Usually there are a number of such audiences during the given day. Prince Nikolaus was in Nancy on Wednesday where he participated in a conference titled "European Journey - From the Congress of Vienna to the European Union" in his capacity as president of the European Society Coudenhove-Kalergi. He also signed the French city's golden book. See the full schedule here and two pictures here and here. Prince Philipp was in Geneva a few days ago where he met the Secretary General of the World Federation of United Nations Associations and also the participants of the Leadership Training Program. Pictures on Facebook. Prince Max hosted some kind of gala dinner about a week ago at the Princely Family's Gartenpalais in Vienna.